Let’s face it it is Fall time and cooler temperatures are here if you like it or not. Just because the weather cools off does not mean after school activities slow down either. Since I want a warm home cooked meal most nights I look to my slow cooker for a lot of meals. My crock pot is on the counter 3 or the 7 days during the fall time. 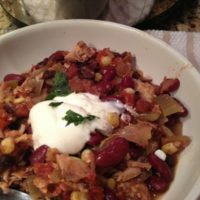 I wanted to share this amazing slow cooker Chicken chili recipe that you can add frozen raw chicken, no prep besides cutting a few veggies you may choose to add. I have also nick named this recipe, recycle day chili. Since most of the items are canned I like to do it around recycle day! !I had some cubed frozen chicken breasts in my freezer so I experimented and threw those in. They did get a little broken up but I thought it was a delicious dish anyway. 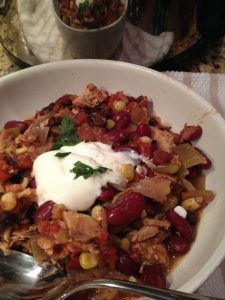 crock pot chicken chili makes a great make ahead dinner in the cooler months. COMBINE beans, Tomatoes (or the salsa, tomato sauce )and chili powder and cumin in slow cooker. Top with chicken, onions, celery and corn and other veggies you choose. (Do not stir.) Cover with lid. What a great way to warm up on a cool night. 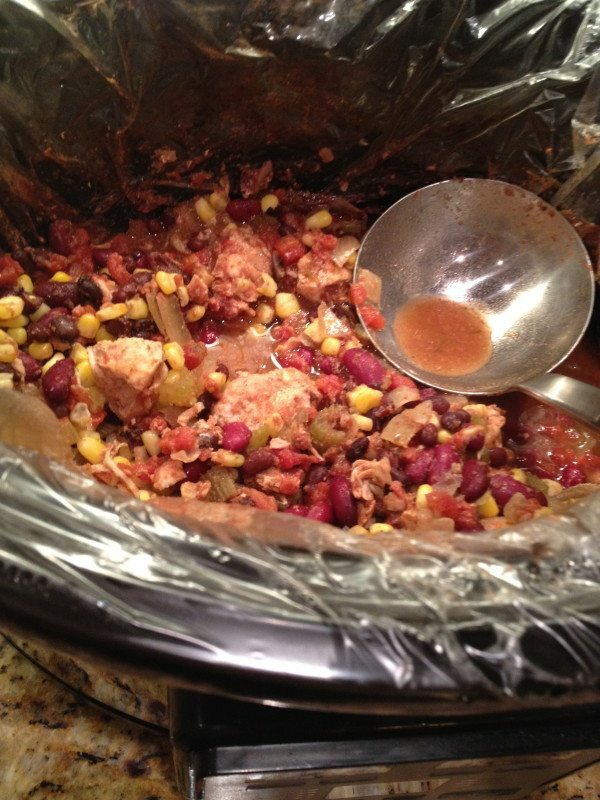 Use a crock pot liner for easy clean up too. This makes about 6 servings and you can easily double for a larger crowd or if you want to freeze some for a later date!! 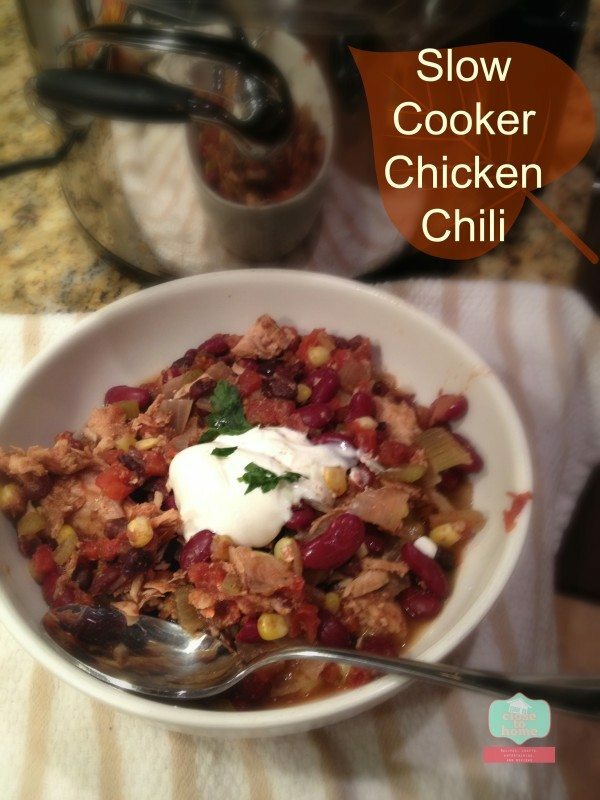 What is your favorite crock pot chili? I made this for the SRC this month and it’s lovely and so easy. It’s reminded me to use my slow cooker more too. I think any type of beans would be good. I threw in whatever I had left in the pantry! Oh that looks delicious! What a perfect pantry recipe, too. I need to make it, maybe with black beans? Yummy! Now I want to have Chilli for dinner! looks really good for these cold November nights. I like the corn and chicken in the chili. yum! That looks crazy good! You have been pinned! Looks amazing! i am ready for Chili!